Daniel is written partly in Hebrew and partly in Aramaic. It begins with narratives about Daniel and his friends, in a genre called ‘court tales’ (chapters one to six). Esther also belongs to this genre; as does Bel and the Dragon from the Apocrypha. The Book of Daniel is in the Ketuvim, but in a non-Jewish bible it will be found in the Prophets, after Ezekiel and before Hosea. Daniel, a Judean exile at the court of Nebuchadnezzar II (605 to 562 BC), the ruler of Babylon, becomes a prominent official in the government. As the author appears to have knowledge of Alexander the Great and the Seleucid and Ptolemaic empires which followed him, there has been a consensus in bible criticism to date the book to the Maccabean period, about 165 BCE, shortly before the death of Antiochus IV Epiphanes. In particular, the vision in Chapter 11, which focuses on a series of wars between the “King of the North” and the “King of the South”, is generally interpreted as a record of Levantine history from the time of Alexander the Great down to the era of Antiochus IV, with the “Kings of the North” being the Seleucid kings of Syria and the “Kings of the South” being the Ptolemaic rulers of Egypt. And as for me, in the first year of Darius the Mede, I stood up to confirm and strengthen him. 2 “And now I will show you the truth. Behold, three more kings shall arise in Persia, and a fourth shall be far richer than all of them. And when he has become strong through his riches, he shall stir up all against the kingdom of Greece. 3 Then a mighty king shall arise, who shall rule with great dominion and do as he wills. 4 And as soon as he has arisen, his kingdom shall be broken and divided toward the four winds of heaven, but not to his posterity, nor according to the authority with which he ruled, for his kingdom shall be plucked up and go to others besides these. In Josephus’s account of Alexander’s visit to Jerusalem, Alexander was presented with a copy of the book of Daniel, which would make the work extant around 330 BCE. The period of Antiochus IV Epiphanes is 175 – 164 BCE, when the Hellenization of Judah was advanced, with the complicity of a high priest called Jason. The religious opposition to Hellenization took the name Hasidim. Antiochus attacked the Egyptian army of Ptolemy VI in 168, but was forced back by Roman intervention, under the direction of a consul called Popilius. Meanwhile Antiochus began to suppress Jewish resistance to his policies in Jerusalem, which led to the Maccabean revolt. Indeed it so came to pass that our nation suffered these things under Antiochus Epiphanes, according to Dasniel’s vision, and what he wrote many years before they came to pass. While there seems to be a consensus among scholars that the legendary stories of chapters 1-6 are older than the visions in chapters 7-12, there is considerable support for the view that Chapter 7 and following were written as a message of encouragement to the hasidim suffering for their faith under the oppression of Antiochus IV Epiphanes. The name Daniel is attributed to a son of David and Abigail , to a priest who returned with Ezra to Jerusalem and, without the letter yod, to a legendary hero whom Ezekiel compares with Job and Noah. The name Daniel occurs also in Nehemiah, as a signatory to a written pledge, against intermarriage and concerning shemitta, sacrifice and tithing. The Talmudic view of Daniel is that it was written by ‘the men of the great assembly’ – ie the leaders during the restoration of the Temple. Rashi said that the reason Daniel did not write the book himself is the prohibition against prophecy outside Eretz Israel. This tradition which dates the book to the fifth or fourth century BCE accounts for the fact that much of the book is written in Aramaic, the language of the Persian empire. Daniel was present at Belshazzar’s feast, and interpreted the writing on the wall. He surrvived the Babylonian Empire, which fell that night, and achieved prominence in the Persian Empire, under Darius. This enables Daniel to be present, according to some midrashim, at the court of King Ahasuerus. Daniel resembles Joseph, a wise and esteemed foreigner, called to the royal court when the kings’ advisers fail to come up with the goods. The three chapters we are looking at on 30/03/2011 are in Hebrew up to Chapter 2 verse 4a, and in Aramaic from 2:4b. Chapter 1 recapitulates the siege of Jerusalem by Nebuchadnezzar, and the abduction of king Jehoiakim to Babylon, called here Shinar, along with the créme de la créme of Jerusalem society, especially good looking and intelligent young men. The young men are prepared to be presentable to the king, for a period of three years. One trusts they did not pay tuition fees. In the case of Ahasuerus, the maidens were prepared for the king in the course of just one year. Verse 6 introduces Daniel and his companions, Hananiah, Mishael and Azariah. They are all given Babylonian names, respectively: Belteshazzar, Shadrach, Meshach and Abed-nego. Daniel did not want to eat the unkosher food and wine which the king provided and ‘God granted Daniel mercy and compassion in the sight of the chief and the officers,’ who provided him and his companions with pulses and water, on which they thrived. The word translated as pulses or vegetables is זרעים , literally seeds. When they were brought before King Nebuchadnezzar, the surpassed in appearance and learning all the magicians and enchanters of the kingdom. The Hebrew expression החרטמים האשפים (ha-hartummim ha-ashafim) is particular to the Book of Daniel. Hartummin without ashafim occurs with the meaning of Egyptian magicians in the Egyptian narratives of Joseph and Moses. BDB makes a connection between hartummim and heret, to engrave, suggesting the knowledge of occult writing, perhaps comparable to the runes of Europe. Ashaf is considered a loan word from Assyrian asipu. This is reminiscent of Joseph called before Pharaoh to interpret his dreams. Besides the hartummin and ashafim, the king sends for mekashevim. – this term for a sorcerer is not unusual in Tanakh or in the Talmud – and Casdim, that is to say Chaldeans the generic name for Babylonians ruled by Nebuchadnezzar. The connotation here is that sorcery is a significant element of Chaldean scholarship. It is explained that the Chaldeans speak Aramaic and, from this point, not only the direct speech but the narrative continues in Aramaic. Notice the formula ‘O king, live forever’ – מלכּא לעלמין חיי. We are reminded of Bathsheba’s words to David: ‘May my lord King David live forever.’ ‘O king, live forever’ is used also by Nehemiah to King Artaxerxes and on several subsequent occasions in the book of Daniel. It seems to be a Persian formula for addressing the king. The sorcerers of King Nebuchadzezzar work under pressure, as the king tells them he will have them cut up if they do not interpret the dream. furthermore, he suspects they will collude to save themselves, by coming up with an agreed answer. To their credit, the sorcerers reply ‘Pass’, for which they receive the due death sentence. Daniel and his companions may be under this death sentence themselves, being among the wise men of the court. Daniel sought an audience with the king, but before the appointed time, he prayed with Hananiah, Mishael and Azariah that God would be merciful and save their lives. That night, the meaning of the king’s dream was revealed to Daniel in a vision. Daniel utters a hymn of praise, in Aramaic. When Daniel speaks to the king, he makes it clear that his interpretation of the dream comes from God and not from his own wisdom. He then describes the image in the king’s dream, of a statue whose head was gold, its chest and arms of silver, middle and thighs of brass, legs of iron and feet of iron and clay. A stone then struck at the feet of clay and the whole statue broke into pieces,which were carried away by the wind while the stone became a mountain that filled the earth. When all these kingdoms had run their course, God would set up His own Kingdom, די לעלמין לא תתחבל which would never be destroyed. On hearing this, Nebuchadnezzar bows down before Daniel and commanded that an offering be made to him, as if he were a god. This evokes an episode described by Josephus, where Alexander the Great, arriving in Jerusalem, bows before the High Priest. Alexander then gave the high priest his right hand, and went into the Temple and “offered sacrifice to God according to the high priest’s direction,” treating the whole priesthood magnificently. “And when the Book of Daniel was shown him [see Dan. vii. 6, viii. 5-8, 20-22, xi. 3-4], wherein Daniel declared that one of the Greeks  should destroy the empire of the Persians, he supposed that he was the person intended, and rejoiced thereat. Like Joseph and like Mordecai, Daniel becomes the king’s highest minister, and he gets top jobs also for Shadrach, Meshach and Abed-nego. Nebuchadnezzar reneges almost immediately, erecting a golden image and callig on all the officers of the kingdom to worship it. The term achashdarpnim is essentially the Persian word for a satrap, mentioned also in Esther and Ezra. The signal to worship the statue is sounded by musical instruments: note סומפּניה, sumponiah. The instruments are translated into Greek as σαλπιγγος, συρινγγος, κιθαρας, σαμβυκης, ψαλτηριου, and παντος γενους μουσικων – ‘all kinds of music’. The penalty for disobeying the signal to worship was to be cast into the fiery furnace. We should remember that midrash offers a legend about Abraham and a fiery furnace. Nimrod persecuted Abraham whom he had thrown into a furnace, which Abraham miraculously survived unscathed. The three companions are by no means certain that God will rescue them, but state plainly that they will not worship Nebuchadnezzar’s gods or the golden image he has set up. Nebuchadnezzar now orders that the furnace be heated to an intensity seven times greater than usual: this conveys his extreme anger and the extremity of the punishment; it enhances the courage of the heroes and provides the circumstance which caused the king’s men at arms to die from exposure to the heat. They are thrown fully clothed, including hats (כּרבלות) according to some translations, and bound, into the furnace. The LXX adds that they sang praise and blessings to God as they walked unharmed in the furnace: υμνουντες τον θεον και ευλογουντες τον θεον. The Apocrypha includes a book called ‘The Song of the Three Children,’ which is the song of praise attributed to Azariah, not called Abed-nego in the Greek of the Apocrypha but Αζαριας. This takes the form of Azariah’s prayer, followed by a brief description of the young men’s delivery from the furnace, and a psalm spoken by Azariah, Mishael and Hananiah, ending with a quotation from Psalm 118: ‘Give thanks to the Lord for his mercy endures forever’. The Benedicite, used in the Roman Catholic liturgy, is a Latin translation of verses 35ff of The Song of the Three Children and the hymn is used also in Lutheran and Anglican worship. Elohin having the plural suffix, like the Hebrew equivalent Elohim, the translations seem equally viable, though ‘the son of God’ naturally reflects the theology of a Christian translator. As the words are spoken by Nebuchadnezzar, it is reasonable to think the intention of the words is polytheistic. The fourth person is also referred to, in some translations, as an angel, a translation of Elohim attested in Psalm 8:6. In his next utterance, Nebuchadnezzar refers to God with a monotheistic usage,אלהא עליא, the equivalent of ‘El Elyon’, because he has witnessed the miracle in the fiery furnace. He calls the men out of the fire, addressing the three by name, and they emerge, unhurt, with no traces of smoke on their clothes. Nebuchadnezzar then blesses the God of Shadrach, Mesach and Abed-nego, referring to the fourth person as an angel (מלאך) sent by God, and affirming the events which led to the miracle. He declares that no one is to talk against God; the punishment for those who do is to be cut to pieces, and have their houses destroyed. The reason he gives for this decree is that other gods are not able to deliver comparable miracles. 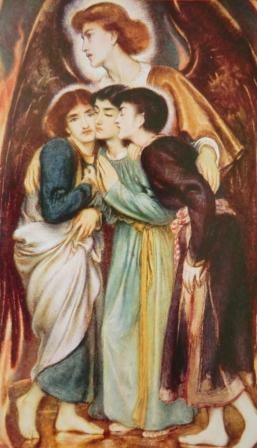 As with Daniel, Mordecai and Joseph, the three are promoted by the king. Nebuchadnezzar makes a declaration, praising God. The reference to God’s signs and wonders is allusive to the miracles of the Exodus, and Nebuchadnezzar is cast in the role of Pharaoh – the Pharaoh who knew Joseph (Hebrew courtier) and the Pharaoh who knew Moses (signs and wonders). The language makes a connection between exile in Egyptian and exile in Babylon. In the last verse, the word שלטן, dominion, from ש ל ט, ‘to rule’ is interesting as one can suppose that the word sultan is cognate; shiltun appears in the Yom Kippur liturgy (uvecheyn teyn pachdecha ), and it is more common to Talmudic usage than biblical. The Apocrypha contains three books which are additions to the biblical Daniel; the first of these, which we noted, is The Song of the Three Children, concerning Hananiah, Mishael and Azariah; in the second, the History of Susanna, a youth called Daniel intervenes in a case of false testimony, and in Bel and the Dragon, set at the court of King Cyrus of Persia, Daniel shows that an idol called Bel is not, as supposed by Cyrus, a living god. Bel appears to eat and drink copious quantities, but this is really a scam by the priests of Bel, to get provisions for themselves and their families. There was also a dragon which the king believed to be a god, but which expired when Daniel poisoned it. This made Daniel so unpopular that the king, under pressure, had Daniel thrown in a lions’ den. However, God sent the prophet Habakkuk with packed lunches for Daniel, and when the king looked in the lions’ den after seven days, Daniel and the lions were all in good health. This of course resembles chapter six of the canonical Daniel, where envious courtiers tell Darius the king that Daniel persists in worshipping God, illicitly.Daniel is then thrown in the lions’ den; but we shall read of this in our next session.